Artist, playwright, actor and musician Sekou Andrews will use spoken word to challenge and inspire all of us. 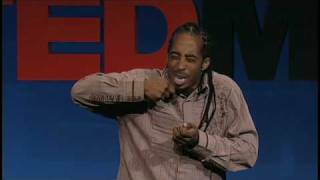 Sekou Andrews is inspiring the business world one poem at a time with the Sekou effect. As an award-winning and internationally acclaimed Poetic Voice, Sekou creates personalized poetic presentations that give voice to the messages and missions of businesses and help them tell their most powerful stories. He is creator and leader of this cutting-edge category of speaking that combines strategic storytelling, inspirational speaking, spoken word poetry, and the power of theater and comedy to make events into experiences, and transform audiences of informed receivers into enrolled responders. Sekou does more than inspire us with his story; he inspires us with our story. An elementary schoolteacher turned actor, musician, national poetry slam champion, entrepreneur, and now the world’s leading Poetic Voice, any given day may now find Sekou presenting an original talk for international marketing executives, giving a keynote speech at a leadership conference, or performing pieces for Barack Obama in Oprah’s backyard and Hillary Clinton in Quincy Jones’ living room. His work has been featured on such diverse national media outlets as ABC World News, MSNBC, HBO, Good Morning America, Showtime, MTV and BET, and he has performed privately for such prominent individuals as Maya Angelou, Larry King, Norman Lear, Sean “P-Diddy” Combs, and Coretta Scott King and family. Companies and organizations that have experienced “The Sekou Effect” include Kraft, Nike, Time Warner, Global Green, Banana Republic, eBay, Microsoft, Google, LinkedIn, Express, Paypal, General Mills, TEDx, Wieden+Kennedy, NBA, NCAA, Chopra Center, Experient, Singularity University and the Million Dollar Round Table to name but a few. Sekou has also emerged as an engaging voice for healthcare, routinely evoking tears, cheers, and standing ovations at various cutting edge conferences/clients, including Johnson & Johnson, Mayo Clinic, Kaiser Permanente, TEDMED, Roche, IHI Forum, Health Media, SCHA Patient Safety Symposium, Sharp Healthcare, Big Task Weekend, Medco, and Health 2.0. Beyond the business world, Sekou has inspired audiences from the HBO US Comedy Arts Festival to The Pasadena Pops Orchestra. He is also a successful voiceover artist and actor with several national commercials and 2 feature films on his resume; not to mention his two-man spoken word play “The Word Begins”, with creative partner Steve Connell, which received critical acclaim and garnered 3 Helen Hayes award nominations during its premiere run in Washington DC. As a recording artist and producer, Sekou’s latest album, “Poetic License,” has made him the most awarded artist in the nation’s largest independent music organization. With all of the innovation and inspiration that is the Poetic Voice, Sekou Andrews gives voice to your most powerful story, shows you the best version of yourself, and helps you live into it.